Has Assad's New Offensive Changed Syria's Front Lines? Backed by heavy Russian airstrikes, government forces and allied militias fighting to support Bashar al-Assad have launched a series of coordinated ground offensives across northwestern Syria since the beginning of October. The hope is to regain territory lost to rebels over the past year and to shore up areas vital to Assad's survival. But while state-run Syrian and Russian media highlight success after success, the results may not be as promising as Assad and his backers would have liked. The two most important offensives, each of which has its own objective, have primarily taken place between the cities of Aleppo and Hama. In Aleppo, there are three broad goals. The first aim is to push back rebel strongholds southwest of the city to broaden the government's line of control in Syria's north, a move vital to ensuring the government's future legitimacy in the area, even though the majority of the country lies outside its control. Further east, the objective is to try to break the siege of the isolated Kweiris government air base, besieged by Islamic State (ISIS) militants since the beginning of 2014. Finally, the long-standing initiative is to try to break the rebel sieges of the Shiite villages of Nubl and Zahara and to complete renewed attempts at encircling the city of Aleppo. Saraya al-Khorasani announcing via Facebook its involvement in operations to break the sieges of Nubl and Zahara. Interestingly, this post was subsequently removed from the group's Facebook pages. The man in charge of all operations in the area is Qasim Suleimani, commander of the Iranian Revolutionary Guards' Quds Force, an elite group primarily responsible for extraterritorial military and clandestine operations. Suleimani has brought together multiple proxy militias in the area to help achieve his objectives, including Harakat al-Nujaba' (an Iraqi Shiite militia that has long fought in the Aleppo area), Kata'ib Hezbollah – an Iraqi Shiite militia trained by members of Iran's Quds Force who had initially withdrawn from Syria to focus on Iraq, but upon Suleimani's request sent a contingent back to Syria – and Quwat al-Ridha, a Hezbollah group made up of Syrian Shiites primarily from Homs province. Assistance is also being provided by the Afghan Shiite Hazara militia Liwa al-Fatemiyun, which is trained by the Quds Force and has already claimed some fallen fighters on the southern Aleppo front, while Saraya al-Khorasani – an Iraqi Shiite militia that first emerged in Syria in 2013 – claimed in Facebook posts on November 7 that it too was preparing to break the sieges of Nubl and Zahara. On the Aleppo fronts, initial government-sponsored moves against ISIS seemed promising, and internal documents obtained from ISIS-controlled areas of Aleppo show that ISIS has responded by launching a new mobilization call within the province of Aleppo, opening a handful of new training camps given the name Jund al-Malahem (Arabic for "Soldiers of the Epic Battles"). ISIS also launched its own counteroffensives – a classic diversion tactic – targeting the government strongholds of al-Safira and the Athariya-Khanasir road in Aleppo that serves as a crucial supply line to the city. Yet, as of November 10, government forces claim that the siege of Kweiris air base has now been broken; if maintained, this would mark Assad's biggest success yet since the beginning of the Russian intervention in Syria. The government has also scored notable gains against rebels to the west, but a sense of optimism exists among rebel forces that they can accustom themselves to the ground offensive and Russian bombardment. "We know the tactics of the regime and the Russian bombing," said a spokesman for Jaish al-Mujahideen, one of the rebel groups fighting back against the government's new Aleppo offensives. Jaish al-Mujahideen originated as a coalition of Aleppo groups to fight ISIS at the start of 2014 and has received support from the CIA. The group allegedly has 400 fighters in the southern Aleppo countryside, with 250 of them maintaining front-line duty, and another 400 fighters in the western countryside. 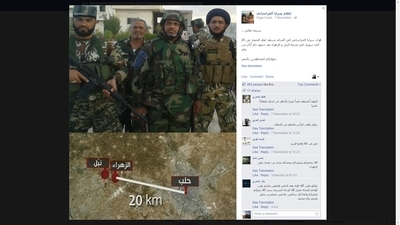 Some 300 of Jaish al-Mujahideen's fighters are based in the northern Aleppo countryside, fighting against ISIS. On average, rotations in front-line duty occur every three days. Though al-Qaida's affiliate in Syria, Jabhat al-Nusra, has heavily advertised its role in the southern Aleppo fighting, the representative from Jaish al-Mujahideen sought to downplay the group's presence, describing their numbers as "very small" while also noting the participation of Ahrar al-Sham and factions connected to the Free Syrian Army (FSA). Among those other factions are the likes of Kata'ib Thuwar al-Sham – a Levant Front break-off whose overall military commander was killed in the south Aleppo fighting in late October – and Liwa Suqur al-Jabal, an FSA group that possesses TOW missiles. Things have proven more difficult for Assad's forces in the northern Hama and southern Idlib areas, where, unlike Aleppo province, rebel coordination is better and there is no additional front line against ISIS. Here, the government's goal ostensibly has been to drive the rebel presence out of northern Hama province and ultimately regain areas on the peripheries of Idlib province from the south and west to reduce the threat to vital government heartlands. As with the fighting in Idlib province that saw government forces driven out of all major towns in the spring of this year, the Islamist-jihadi coalition Jaish al-Fatah is taking a lead role in pushing back the latest offensives and launching a counterattack known as the Ghazwat Hama. A media activist based in Idlib for one of the Jaish al-Fatah components – Ajnad al-Sham – explained his group's role in these battles in an interview with Syria Deeply on November 2: "In the battles of north Hama countryside, [we are] on the Skeik front maintaining the front line, and on the Atshan front the battle is ongoing, and in the western Hama countryside in the village of al-Bahsa and al-Mansura maintaining front-line duty and resisting the entry of the army ... of course we are a faction not affiliated with any other faction. Ajnad al-Sham: only with the Jaish al-Fatah operations room." Jaish al-Fatah itself has been hit by recent controversies regarding fractures within the ranks, as "third-way" jihadist faction Jund al-Aqsa announced it was leaving Jaish al-Fatah in late October over disagreements with some factions in the coalition that advocated political approaches contrary to the implementation of Islamic law, as well as rejecting the insistence on actively fighting ISIS. Like other "third-way" jihadi groups, Jund al-Aqsa is aligned ideologically with al-Qaida but supports the approach that one should fight against ISIS only in real self-defense. The Saudi jihadi cleric Abdullah al-Muheisseini, a key ideological heavyweight in Jaish al-Fatah, has tried to broker a reconciliation, but no official announcement from Jund al-Aqsa has come yet of a return to Jaish al-Fatah. Rumours had also emerged of a Jabhat al-Nusra split from Jaish al-Fatah, but the Ajnad al-Sham media activist denied that they were true. The Jund al-Aqsa departure from Jaish al-Fatah did not lead to any major fallout on the battlefield, and on November 5 Jund al-Aqsa played a leading role in retaking the city of Morek in northern Hama from the government. Morek had been captured by government troops in October 2014. The assault to retake Morek from the rebels back then was a major campaign for pro-government militias such as the National Ideological Resistance (another Syrian Hezbollah group) and the Syrian Social Nationalist Party's Nusur al-Zawba'a ("Eagles of the Whirlwind"). It would be a mistake to think that only Jaish al-Fatah is involved in the current Idlib-Hama fighting. Western-backed rebel groups operating TOW missiles play a notable auxiliary role in debilitating government capabilities on the ground, which are ultimately necessary for follow-up if Russian airstrikes are to produce any major and lasting changes. 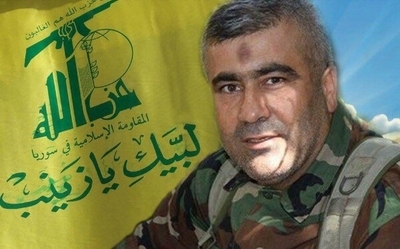 Ali Balhas (al-Haj Jawad), the Hezbollah commander killed on the Khanaser road. Though rebel groups have lost senior personnel since the beginning of the Russian intervention, it's clear that forces on the government side have taken heavy losses as well. For example, from October 31 to November 2, Hezbollah lost at least eight fighters. Though political sensitivities often mean that locations of deaths for Hezbollah fighters are not disclosed, Syria Deeply learned that a prominent Hezbollah commander – Ali Balhas, whose death was announced earlier this month – was killed on the Khanaser road trying to prevent ISIS from cutting the route to Aleppo. This was ascertained via contact with the main Facebook page set up in dedication to him. More generally, the growing number of announcements in Iranian media of personnel killed in Syria corroborates earlier speculation of greater involvement of Iranian ground forces in the new offensives, even if they are not doing the bulk of the fighting. Looking to the future, one can envision multiple scenarios for the rebels. The first is that they continue to adapt to the Russian airstrikes and that increased supplies of weaponry by foreign backers help inflict further and much greater damage on government abilities to press ground offensives. This could potentially lead to the opposite of what the Russians intended: even greater gains for the rebels, perhaps culminating in a serious offensive on Hama city itself. The second scenario would be the development of a timeline in which, after many more weeks of local back-and-forth, the government begins gaining significant ground, above all in Aleppo province. The third possible scenario is a solidified, long-term stalemate on all front lines. It may be too early to predict which way things will go, but the results on the ground do not show the sweeping victories Assad and his backers hoped for.